I never met the Queen of Soul. I came close back in the summer of 2007, when my family visited Detroit for a family reunion. We learned that Franklin was having a three-day revival at Emmanuel Institutional Church of God in Christ on Schaefer Highway and we stopped in on one of the services. Smokie Norful, Ruby Terry Reverend Joseph Lowery were on the program; the Queen was there, but she opted to sit in the very far left corner of the church’s pulpit, acting as a careful supervisor of the events for the most part. Instead of being the star of the show, she preferred for Jesus to get all the glory…and the gospel sensations working the room that night. She did hop on the piano and played behind Ruby Terry, which was a glorious treat. And yes, we all were fanning the sweat from our sizzling pours. It was Aretha’s orders to have the air conditioners turned off, a custom of hers. I wanted to meet her that night, but I may have been way too shy to do it. I may have been a bit fearful. My goodness, she was the Queen of Soul, an icon that I totally revered as a young lad growing up on my mom’s vinyl records and being so impressed by the soul and perfection that came from albums like I Never Loved a Man The Way I Love You, Aretha Arrives, Young Gifted and Black (on 8-track), Amazing Grace (on cassette) and that hit-laden compilation Aretha’s Gold, a seismic record that was played to smithereens. 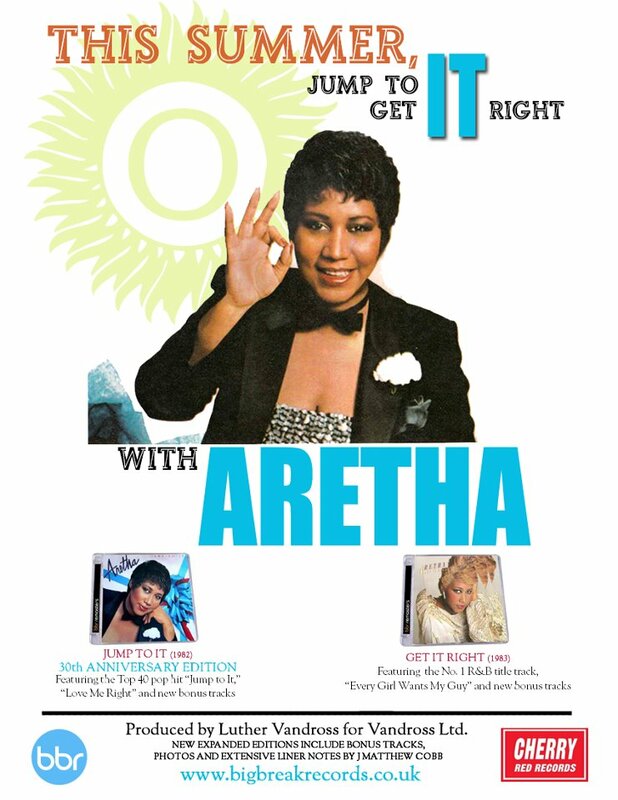 Promotional ad for Big Break Records reissues of Aretha Franklin’s Jump to It & Get It Right. And regrettably, I never interviewed her. I did reach out to her management when I was tasked to handle the liner notes for the Big Break Records’ 2012 reissues of Jump to It and Get It Right. I did get a response from Qwendolyn, her longtime publicst, although it was a tepid one. She asked me to call her the next morning about a possible interview. I did, but I got no response. The interview never materialized. As you may be aware, I don’t kiss up as a journalist. Although I’m quite sensitive when dealing with my subjects, I stay the task and try to tell the whole story. And I did just that. I’m proud of my work on those collections. It blessed me all the more when I got a Facebook email from renowned soul music journalist David Nathan congratulating me on those liner notes. He had interviewed Franklin numerous times and had even supervised the liner note essay for Aretha’s Best 2001 compilation. Hearing from him, a pioneer in the game, was all the confirmation I needed that I did a job well done. I also have to add that I smiled a good bit when I started seeing the hashtag #arethasings being used on Aretha’s socials. Her Instagram handle is actually “Arethasings.” Those who know me well should be familiar with me using #jmattspeaks when I closed out on my rants, ramblings or published posts via Facebook. It stuck. And I guess Gwen, her publicist, got a little inspiration to use it on Ms. Franklin. I’m glad a little of me rubbed off on her. Despite never meeting the Queen, I felt like I did, because there are a number of people in my galaxy of contacts – from friends to acquaintances to business professionals – that have. Some of my friends were very close friends with her. Some even worked with her. If I start naming them, I’ll probably omit one. Today I shed a tear for all of them as they endure the pain of such a loss. I will shed another tear for the Queen because she remained a fixture in my household. She provided the soundtrack of my life. Her records were always on deck. And gosh, hearing her vocal runs; that fiery melisma born from the Sunday morning sweat of her faith and then trying to imitate her voice with my nervous falsetto. Gosh, I remember when “Freeway of Love” came out and riding around in my aunt’s very own pink Cadillac. What a highlight. I can go on and on. And will probably reflect more on her impact in days to come. But I wanted to share just enough with you, to shed some “R-E-S-P-E-C-T” and let you all know what Ms. ReRe meant to me. Never forget; she will forever and always be the Queen of Soul. And let me also add: GOAT. J MATTHEW COBB is the managing editor of HiFi Magazine. Follow him on Facebook, Instagram and Twitter. What a lovely and moving tribute. Great job as usual J! Thanks, Juanita! Appreciate the kind words.